LG smartphones have started to emerge with some pretty slick handsets, and considering the competition, it really came out strong with its Optimus lineup. 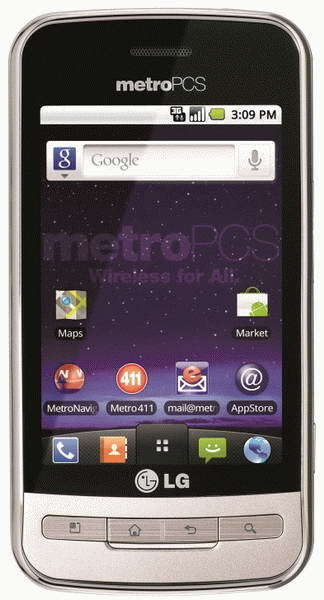 In January 2010, MetroPCS was kind enough to send me an LG Optimus M to review. I was able to use it for a month, which gave me plenty of time to really get a good feel for the ins and outs of this prepaid smartphone. Here you'll find notes and thoughts about my personal experience with the handset. Please note that although the smartphone was provided by MetroPCS, I am in no way being compensated to provide my opinions. In other words, good, bad, or otherwise, these are my opinions, and I have not (and will never be!) influenced by any wireless provider to provide a positive review. The phone I received came in what I call a dealer box, meaning that it's not in that hard-to-open plastic bubble packaging found in most major retailers. It was clean and simple, with nothing that stood out other than to say that I enjoyed the simplicity of the box contents: the phone, USB cable with wall adapter, a manual, terms and conditions, coupon for $5 off of a hands free ear piece (NOT Bluetooth), intro to MetroNavigator, a quick start guide, as well as a 2GB memory card. My first thoughts when I took out the phone were that the handset is extremely well constructed, felt great in my hand, and looked just as high end as any of the most expensive smartphones out there (Android or otherwise). It's got some weight to it (largely from the battery) that makes it feel solid, and not cheap and flimsy. Given that the LG Optimus M is positioned as a low to mid-tier amongst LG smartphones, I think LG and MetroPCS did a fantastic job here. The smartphone has four hardware/physical buttons on the bottom of the screen: Menu, Home, Return, and Search. While they look nice, and have a great quality and tactile feel, I much prefer soft buttons like those found on the Sanyo Zio. After zipping along with the touchscreen navigation, I find the extra effort to push a physical button to be annoying and slows me down. I'm not sure if all LG smartphones are like this. I found no way to natively reassign these buttons to other apps. There's also a physical power button on the top right edge of the smartphone, though I found myself using it less and less, and just waking the phone with one of the hardware buttons on the front. I also have to note that nowhere on the phone is an LED indicator to show you when you've missed calls or emails. I truly see this as a major design flaw, and found it (or rather the lack of it) to be materially detrimental to my experience using the phone. I know other phones are plagued with this "flaw," however, that doesn't make it any less irritating, and I hope that other LG smartphones will take this into consideration. Another thing to note that some people may find silly, or not even notice at all is the screen protector that came pre-installed on the handset. Every phone I've purchased to date has a plastic screen cover from the factory. It always has a gummy feel to it, and distorts the screen and the sensitivity of touchscreen phones. That's typical, and makes a lot of sense, as it's really only meant to protect the screen until the end user receives it, and is not meant to be a permanent screen cover. 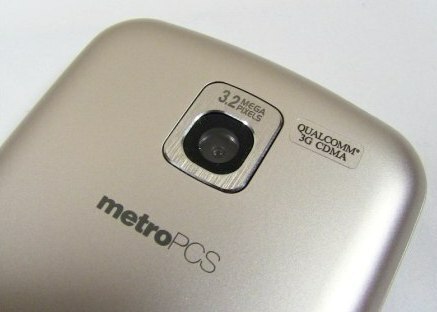 On MetroPCS's LG Optimus M, however, the screen cover is as good quality as any screen protector that I've ever purchased. Getting a screen protector for my smartphones is usually the first thing I buy, and I spend between $8 - $15 dollars for a top notch protector. Anyway, I think this is a nice touch, and an extra bonus for people like me who insist on getting a screen protector. I'm not sure if other LG smartphones come with the same quality screen protector. It came preloaded with Android OS 2.2. This was the latest Android operating system at the time, and was nice because it meant that I didn't have to bother finding or waiting for an upgrade. There were some meaningful upgrades from 2.1 to 2.2 (which I won't get into here) that I appreciated having right out of the box. While I've had the opportunity to play around with Android in the past, this was actually my first extensive use of the Android operating system. As the operating system is fairly standard, and not necessarily specific to the prepaid wireless carrier (in this case MetroPCS), if you're interested in a more detailed discussion, you can visit the dedicated Android OS page. MetroPCS App Store - There's a number of free apps listed here, including Boingo Mobile Wi-Fi, Loopt, MetroPCS Mail, etc. MetroPCS Mail - It's a nice client to help you setup virtually any mail client, including Microsoft Exchange. You can also setup and use a Metro email address. I still find this peculiar; do you know anyone who uses a wireless carrier email address anymore? The standard Android mail client is very similar, and I think that it's confusing for users to know which client to use. Personally I'd stick with the standard Android client or Gmail client as it's more likely to be frequently updated. Metro411 - A nice app for finding local venues, though Google Maps provides much of the same functionality. MetroBackup - A nice app to backup your contacts, however, I would recommend using Gmail Contacts, which will automatically sync all of your contacts to the Gmail server, and you'll have them available via Gmail as well. The extra $1/month for MetroBackup doesn't seem to add much value in my opinion, unless you're not using a contacts database that also resides in the cloud. MetroNavigator (by Gokivo) - A pretty slick app that looks very much like Google Maps. Now that Google Maps supports turn-by-turn navigation, I couldn't specifically tell you the benefits of this app over Google Maps, and I expect that MetroPCS is paying licensing fees to Gokivo to have this offered as a free app; I expect it will be removed before too long! I found the 320x480 touchscreen to be of very high quality and bright with vibrant colors, as expected from LG smartphones. It may not be the best display available in the smartphone market today, and other LG smartphones may be better, but without having those phones next to it, I have no complaints at all with the Optimus M. In fact, I typically find myself turning the screen brightness down on most smartphones to help conserve battery life. The keyboard. What do I say about the keyboard?! I'm very conflicted when it comes to virtual keyboards. While I don't like landscape sliding physical keyboards, and prefer the monolith, BlackBerry-style keyboards for quick and easy access to text input, I'm still not sold on virtual keyboards. The keyboard on the Optimus M is as large as it can get I suppose, and rotates horizontally when holding the smartphone in landscape. Compared to the physical keyboards I've been using on phones for years, I find virtual keyboards to be quite slow and awkward. In portrait mode I feel cramped, and in landscape mode I feel I'm slowed down by having to reach further. People who have used physical keyboards for years (ex. BlackBerries and Treos) say that you get used to virtual keyboards. Clearly I'm not there yet. All I can say is that you should definitely spend some time with it in the store before buying. That said, compared to other virtual keyboards I've tried that are the same size, but with less responsive touchscreens, I found the Optimus M to be quite good in comparison, though not as good as the iPhone for reasons I can't quite explain (which is unfortunate, because I'm not particularly a fan of the iPhone!). At some point I'd like to try other LG smartphones to see how they compare. The Optimus M also comes pre-installed with Swype, which is a technology that allows you to trace your word by swiping your finger from one letter to the next without having to lift your finger. It actually works surprisingly well! However, as a touch typist for nearly two decades, I have to say that I don't really consciously know where the letters are. 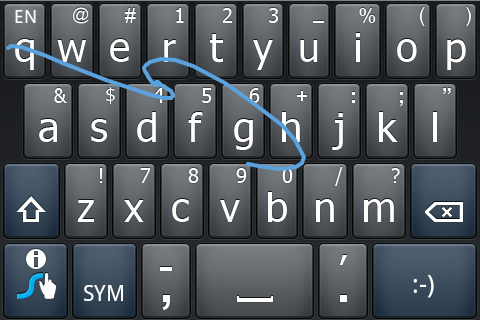 As a result, I find text entry to be very slow with Swype because I'm constantly looking for th next letter, which is often hidden by my fingers! Anyway, as with anything, I'm sure I would get used to it with more practice. Android does offer voice entry for most applications. It works quite well, however, I find that I'm not usually in a location where talking out loud is appropriate, or I'm too tired to talk to my phone after a long day of conference calls! The 3.2 mega pixel camera is nothing to write home about, but does take quality pictures, and I enjoyed having it on hand. My only gripe is that I found the lag time between hitting the shutter and actually capturing the picture to be too slow to capture rapidly moving children. Also, there's no flash, so ambient light is necessary to capture decent images. I have to say that reception was spotty for me, often having only one or two bars. That said, I NEVER had an issue with voice call quality no matter how many bars I had. Where I was disappointed was that I virtually always saw the 1X icon, meaning slow data speeds. Unlike other phones I've used in the past, I found myself seeking out free WiFi hotpsots so I could get some decent data speeds. While email and local data intensive apps worked fine, loading Web pages on the browser was somewhat painful. Perhaps I was mostly using it where MetroPCS doesn't yet have 3G roaming agreements? But for a company touting 4G LTE, I was disappointed to not even have 3G coverage. Note that this is not an issue with LG smartphones only. I never experienced any significant lag loading apps, and screen rotation was relatively zippy. I'm not sure, however, how it compares to other LG smartphones. Battery life with not only LG smartphones, but all smartphones is a real issue. The LG Optimus M was no better or worse than any other smartphone I've used. I prefer not to quote talk time or Internet browsing hours, because that tends to not be very indicative due to talking, email, live widgets, background apps, etc. With moderate use, you'll barely make it through the day, and with heavy use, you'll most certainly need to charge it up. For anyone, no matter what your usage is, and no matter what smartphone you're using, I would recommend having a charger on hand, whether it's another wall charger at work, an adapter for the car, or a USB cable you can plug into your computer. Fortunately, the Optimus M uses the current micro USB standard connector, so I've got plenty of chargers to cover me! While I'm still battling with whether or not I can get used to a virtual keyboard, I found MetroPCS's LG Optimus M to be extremely impressive in terms of quality and performance. Both in appearance and performance, no one would be able to look down on the phone as being a prepaid smartphone. Gone are the days where prepaid wireless is a second class citizen, and this prepaid smartphone proves it. If future LG smartphones can build on this quality, we should continue to see great prepaid smartphones available. MetroPCS truly has a winner with this handset! 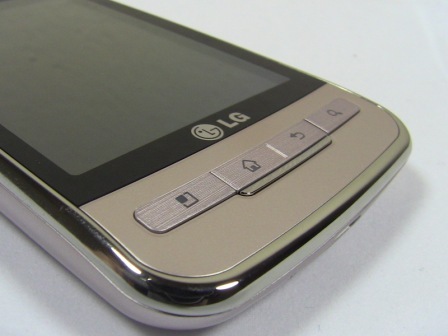 To comment on this smartphone, please feel free to visit the LG Optimus page. To see how the LG Optimus M compares to other prepaid smartphones, please feel free to visit the Smartphone Comparison page. To share your opinions about other prepaid smartphones, please visit the Smartphone Review page!